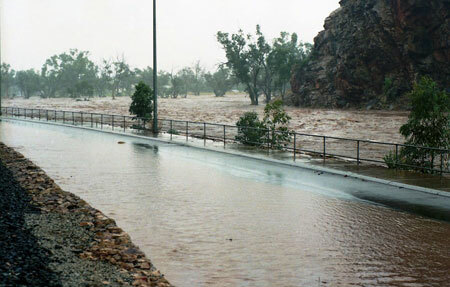 El Niño in 1983, 1988 and 1998 sparked a flurry of flood mitigation planning in Alice Springs, such as it is under way now, as the climate event is again causing extensive warming of the central and eastern tropical Pacific. For two of the years – 1983 and 1988 – there was publicity about the flood risk for the town just prior to major floods striking it. A flood-warning pamphlet (at right) depicts the raging Todd River across the Wills Terrace Causeway during the flood of March 1983. This event, along with the year overall, was almost a carbon copy of 1972. This pamphlet was released in January 1988, shortly before the major flood of that year. 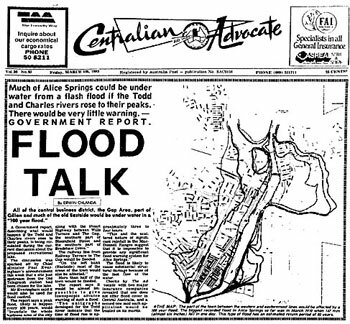 It was an extraordinary coincidence, as there was a prominent warning of the flood risk for Alice Springs published early in March 1983 (at left), literally days before that year’s flood struck the town. The report was written by Erwin Chlanda, now the editor of the Alice Springs News Online. There was a twist for 1998, as The Alice responded with aid for Katherine which was inundated by a massive flood on Australia Day. There was no flood in Alice Springs in 1998 but heavy rain over several days set a new (albeit brief) rainfall record for April that year. Is this mere coincidence or can an underlying pattern be discerned for major rainfall and flood events in Alice Springs? Although there has been a strong El Niño since last year, there was no flood in March or April so there is already a departure from the sequence of events noted for the earlier years. However there is a striking similarity between this year to date and 1986, which recorded heavy rain at the beginning of July. To ascertain this pattern, it’s necessary to identify the factors that influence weather in the Centre. The seasons are obvious, reflecting the pattern of temperate latitudes but rainfall records overall display the wet-dry influence of the tropics. Some long-time observers note another pattern of widespread prolonged rain and flooding about once per decade. Each peak period of exceptional rainfall is characterised by a duration of one to two years, with the heaviest rain occurring in summer (especially February) but with good rainfall extending into the winters, too. Two such sequences are 1946, 1956, 1966, and 1989-91, 2000-01, and 2010-11. The years 1989-91 were below average in Alice Springs but far heavier rain fell across other areas in the Centre and there was major flooding in eastern inland Australia in 1990. The main influence behind the decadal pattern appears to be sunspot activity, which peaks every 11 years. This means we can anticipate 2021-2 will likely be well above average wet years in the Centre and across much of Australia. Seasonal and solar patterns are rhythmic so their effects on local weather are largely predictable but this is offset by the influence of ocean currents. Most prominent are conditions in the Pacific Ocean that give rise to El Niño or its counterpart La Niña. El Niño is dreaded in Australi a as it is associated with drought conditions and high temperatures across much of the continent. The impact of El Niño is detectable in Central Australia although it is moderated by other influences, too. The record of El Niño events since 1900 listed by the Bureau of Meteorology shows its occurrence is arrhythmic, sometimes in quick succession (1990s) and at other times apparently absent (1920s and 30s). The intensity of El Niño also varies widely, with weaker events appearing to have stronger impacts in Central Australia. Conversely strong El Niño events have produced variable results in the NT while other parts of Australia were far more seriously affected. This observation may be significant in explaining some apparent anomalies in the weather records for Alice Springs. The two images here show major flooding of the Todd River in Heavitree Gap. One was taken in early March 1972 by Patricia Nelson (above, left) and the other at the end of March 1988 (below right). 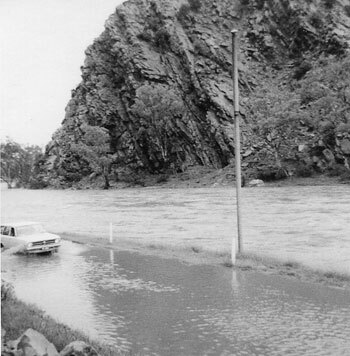 The 1972 flood was the Centre’s largest rainfall event recorded for March since 1910 (in turn still the greatest flood on record in Alice Springs), which followed an extremely dry 1971 although no El Niño was recorded. The rest of 1972 and well into 1973 was also very dry, influenced by a moderate-strong El Niño. The flood of 1988 was preceded by a moderate-strong El Niño. 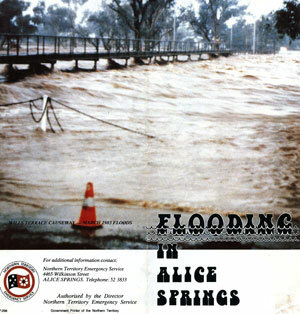 Several major floods or extreme wet weather events recorded in Alice Springs are associated with El Niño, such as the floods of March 1972, March 1983, and March/April 1988; and heavy rainfall in May 1992, May 1993, and April 1998. The later rainfall events appear to have been delayed by the prolongation of hot summer conditions well into March. The floods of the 1980s are well remembered as they occurred in isolated events. By contrast few people recall the 1972 flood as it occurred just prior to the onset of a run of exceptional rainfall years from 1973 to 1979. This period is anomalous and may have been the result of a confluence of causes; for example, the extreme wet years of 1973-75 were characteristic of peak rainfall periods apparently influenced by sunspot activity but commenced at the conclusion of a moderate El Nino in 1972-3. 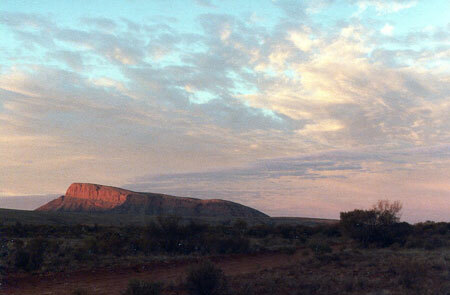 A view of the Todd River in flow from Meyers Hill (below left), after heavy rain in May 1993 saturated the Centre and placed Alice Springs on flood alert. It was the wettest month of the year. The same pattern also occurred the previous year although 1992 was much drier. The summers preceding both events were very hot and prolonged into March. This reflects the successive El Niño events at the time recorded as moderate-strong and moderate respectively. The year of 1986 is of particular interest, when high temperatures continued into March and April (March 1986 set a new national maximum temperature record for Australia, too). The hot weather prolonged the severe drought conditions that commenced in January 1985, all of which typified an El Niño event. The extended dry was abruptly interrupted by very heavy rain in early July. Just one catch – no El Niño was recorded at that time. At Central Mt Wedge at dawn (below right), about June 29, 1986, clouds were the vanguard of a weather front that saturated the Centre at the beginning of July. This event followed an extended summer period with unusually hot weather in March, and was the first significant rain during a severe drought that began in January 1985 although no El Niño was recorded at the time. Will there be a repeat of this wet weather event this year? As noted previously, 2016 is markedly similar to 1986. Overall it has been very dry for an extended period of time, notwithstanding some useful falls of rain across parts of the Centre during this summer, and temperatures continued well above average into March. Nationally the previous temperature record for March set 30 years ago has been smashed this year. However, unlike 1986 there has been a strong El Niño associated with the conditions we’ve experienced this year. Why the anomaly? The problem may be more apparent than real. In my article in June last year warning of impending danger of heat wave conditions I noted that drought conditions already evident across much of Australia since 2014 was reminiscent of an El Niño but at the time there were only indications of one still in the process of forming. This indicates that precursor conditions for an El Niño can also adversely affect Australia, and (as noted before) the weaker the conditions the greater the impact seems to be in Central Australia. All but one of a series of El Niño events recorded in the 1950s and 1960s were recorded as weak yet all are associated with severe dry conditions in the Centre (including the notorious drought of 1958-65). However, Central Australia was afflicted by a far longer drought from 1924 to 1938 yet only one moderate El Niño was recorded in 1925-6 (significantly, widespread rain fell in March and April of 1926). Possibly the remainder of the predominantly dry period to 1938 was influenced by precursor conditions which never eventuated into measurable El Niño events. There is another factor which complicates this explanation still further, and that is human-induced climate change. Prior to the year 2000, records show a strong correlation between El Niño events or precursor conditions and the occurrence of major floods or heavy rain from March to July. Since 2000, however, there seems to be an abrupt reversal of this pattern. Weak El Niño events were recorded for 2002-3, 2006-7 and 2009-10, and all typically characterised by severe dry conditions and prolonged high temperatures in Central Australia. The first two events did not end with any significant rainfall in the cooler months; while 2010 which became one of the wettest years on record was affected by the decadal pattern of sunspot activity. 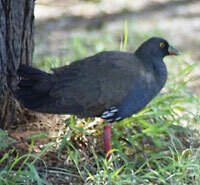 This black-tailed water hen was resting in the shade of a white cedar near the main building at AZRI, photographed shortly before heavy rain in April 1998. It was unusually far from water, however some wildlife (notably waterfowl) are finely attuned to impending rainfall events which prompts aberrant behaviour. The rain set a new record for Alice Springs for the month of April (eclipsed in 2000) which followed an intense El Niño for 1997-8. The impact of climate change is over-riding the natural patterns that influence our weather. The El Niño year of 1997 set a new record for global temperatures but that has been exceeded for 16 of the subsequent years. The interaction of El Niño and climate change is leading us into uncharted waters. In conclusion it’s hard to decide what may be in store for us this year as the current El Niño wanes yet the world continues to set new record high temperatures. If 1986 is a good guide, it’s likely there will be heavy rain and possibly a flood in Central Australia sometime during May to July so it would be as well to be prepared for this possibility. 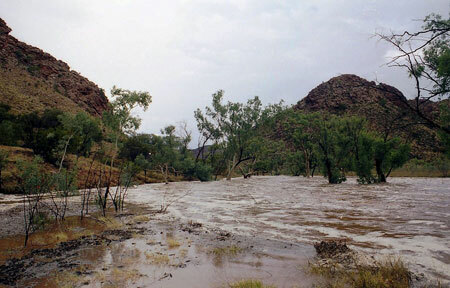 A deluge from an isolated storm prompted the flash flooding of Laura Creek at Fenn Gap (at right), west of Alice Springs, on February 7, 1998. So much water banked up at the gap it flowed upstream over the top of itself yet only half a kilometre east the ground was bone dry. This was the last storm during the long hot summer of 1997-8, influenced by a major El Niño, until the heavy rains in April. @ Alex: What’s in store for you mob in 2016? A wet winter, if Tennant is any guide. We endured a horrible April, with maximum and minimum temperatures both more than four degrees above average. We have also had rain less than a third of the average so far this year. The trees were chasing the dogs. Lo and behold, we have already had more than double the average rainfall for May and if the weather mob are right (they rarely are), by Monday we could be having the wettest May on record. I have always been on the skeptical side about climate change but in a year when all but six per cent of the Barrier Reef dies and we are sweating through temps significantly above average, I have to agree with the Outback Academic (and I am glad we have one to keep us in line): Why the hell isn’t flooding and the environment on the political agenda in an election year? It’s not a matter of if, it’s a matter of when. The council now has had plenty of warning that a major flood is coming, so that they can start cleaning out the debris and growth from the Todd River, so that the river can flow its natural path and reduce the flooding. It is the debris and the growth of saplings, buffel grass and debris which holds the water back. Remove the built up sand at the causeways, which have been very poorly built. My opinion if the council / traditional owners do not take action to help reduce the flood, then people who do get flooded, will have a good case for class action. Interesting report, with attendant “complications” and “reversals”, until “climate change” pops up unaccountably. Are you implying this is man-made or due to the random excesses attributed to the span of recorded information referenced? With respect, if I was a gambler, I wouldn’t be using this as an investment guide. The fact that Alice was built on a flood plain suggests that future prediction on this scale is inherently flawed.